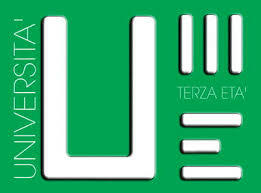 The University of the Third Age, or Unitre as it is known in Italy, is an international concept whose driving message is that learning is lifelong. In other words one does not stop researching and learning just because one reaches a certain age. Although the students coming to the Bagni di Lucca branch of Unitre tend to be mainly those of retirement age, younger students are certainly not excluded from their activities. In order to prevent these negative feelings as much as possible, break down communication barriers between generations and promote cultural and social factors, the first Italian University of the Third Age was born in Turin in 1975. Unitre here is based on the model of the Universities of the Middle Ages where wandering scholars were working as volunteers because they considered that spreading knowledge and culture was an important duty. In fact, Unitre lecturers do not get paid at all, apart from the satisfaction obtained from sharing their knowledge with their students and a free and very convivial lunch at the end of the academic year. BDL’s branch of the Unitre has been functioning for thirteen years now and its programme is very inclusive indeed. Here are the topics from the year 2014 to 2015. As you will see all the lectures are in Italian so they will be very useful for those local first language English speakers to improve their knowledge of the Italian. Combattere l’invecchiamento: l’elisir di lunga vita 3. La figura di Alcide De Gaspari. La prima guerra mondiale: l’entrata in guerra dell’Italia e la guerra di posizione. Feste e ricevimenti a Bagni di Lucca nel ‘700. Maria Montessori: la signora delle mille lire. Thomas Linley: un musicista inglese del ‘700 in Toscana. Looking through the lectures I’ve given I realise that I started out six years ago as a volunteer teacher for BDL’s Unitre. These are the titles of the talks I’ve given. These are the English titles. 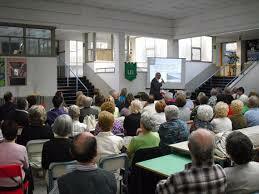 All lectures were delivered in Italian. As one can see the uniting thread in my talks is the relationship between England and Italy through cross-cultural influences in art, architecture, literature and music. Each of my talks has been illustrated both with computer slides and sounds and I have always produced a summary sheet with the most important points of the lecture printed on it. I remain most grateful to Fabio Lucchesi of the Bagni di Lucca branch of Unitre for teaching me many new things as a lecture through his kind invitation to me to participate. This may sound a paradox but for me the best way to learn about a topic is to produce a talk on it. Some of my talks have been published in magazines. 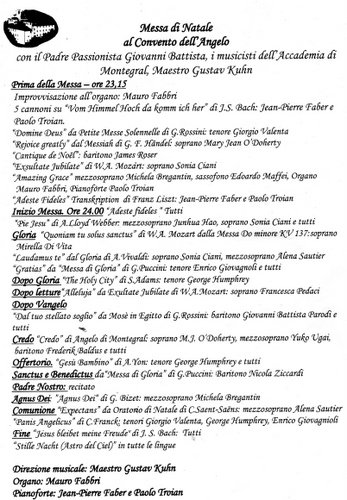 For example, the talks on Geminiani and Verdi appeared in Lucca’s monthly musica magazine, LuccaMusica. I look forwards to many more English people in the area with some knowledge of Italian to attending the lectures which I have always found stimulating and interesting. Every European city with its great art galleries has, at the very least, one must see-painting. Who could leave Paris without seeing the Mona Lisa for example or London without visiting the National Gallery’s Leonardo Cartoon? Vienna, too, has its unmissable work. It’s not in the main gallery of the Kunsthistorisches Museum but a little way outside the Ring and a letter D tram takes one there. We didn’t take this tram as it might have landed us in Lapland! Unlike so many of the world’s most famous paintings this one can be clearly seen in peace and quiet without crowds of people round it trying to have a peep. The gallery where this painting’s located is in a fairy-tale palace surrounded by magic gardens with magnificent views over the ex-imperial capital. The Belvedere was built in the first half of the eighteenth century under the direction of Prince Eugene of Savoy who was the commander in chief of the Hapsburg army at the battle of Zenta in 1697 when the Ottomans were defeated at the gates of Vienna and where large swathes of Europe avoided being converted to Mohammedanism. The architect of this magnificent palace was not the ubiquitous Von Erlach but Johann Lukas Von Hildebrandt, another architect who had studied in Italy. The Belvedere’s entrance hall has great atlas-like figures which cover the fact that they had to be placed there to support the upper floor which was subsiding while the palace was still being built. It’s an elegant solution to a difficult problem. The elaborate frescoes and canvases which decorate the state rooms and the chapel were painted by Italian painters Solimena, Carloni and Fanti. 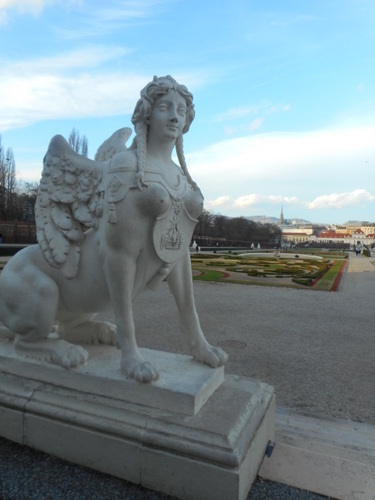 The Belvedere’s setting is enchanting with its gently gardens giving broad prospects towards the city of Vienna. The gardens were a bit colourless at this time of year. However, we must return in the spring and admire the parterres and waterfalls at greater length. Like the privy garden at Hampton Court, the gardens are being restored to their original elaborate baroque splendour. At the time of our visit this December the palace grounds were enlivened by one of Vienna’s traditional Christmas markets. But what special painting did I come to see? I am, of course, referring to Gustav Klimt’s “The Kiss”, a painting which has been given cult status so that it even appears on shopping bags, T-shirts and tea-cloths. Ah, the price of fame! Klimt (1862 –1918) started off as a decorative painter much in demand for beautifying the interior of the new buildings that were being erected on that most wonderful of European boulevards, the Ringstrasse, which took the place of the demolished city walls and enabled Vienna to finally expand beyond its narrow confines. Increasingly exotic influences began to permeate Klimt’s works which originally were in the mainstream academic tradition. In particular, Klimt’s visit to Ravenna, where he came in contact with its fabulous byzantine mosaics, stimulated his artistic vision into something more ethereal. 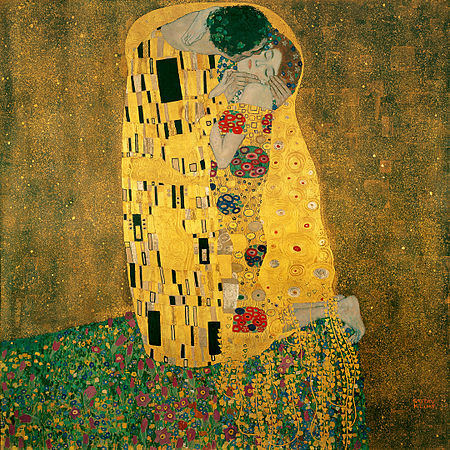 The Belvedere has one large room dedicated to some of Klimt’s most wonderful paintings including the iconic “Kiss”. In this painting one can see most clearly the way this symbolist painter fuses figurative and decorative elements. It’s as if underneath all that luscious gold leaf there lies another, more literal painting. There is a great feeling of japonerie in the figures’ composition and a strangely paradoxical three-dimensional flatness. Of course, I’d seen the painting in its countless reproductions but when one perceives the real thing before one’s eyes it’s as if experiencing this iconic painting for the first time. The physical effect of the canvas is overwhelming: I felt my knees melting and my whole being transported into a Stendhal-effect-like universe. There’s absolutely no doubt. A world of virtual reality will never ever be able to replace reality itself and we must not mistakenly be taken over by that virtuality. These stunning paintings have to be seen in the flesh, or at least in their oil and canvas. PS Incidentally, the highest price paid for any painting was in 2006 when Klimt’s portrait of Adele Bloch-Bauer I was sold at auction for $135 million. I wish I had that money to spend! A well-known personality – indeed an institution – at Bagni di Lucca Villa has suddenly passed away. Renato Petri, the tobacconist, bookseller, hunting, fishing and trekking equipment dealer and owner of the Roma Hotel, which numbered among its past guests Elisa Baiocchi, Napoleon’s sister, and Giacomo Puccini, the great operatic composer, was so well-known among so many of us that it is difficult to realise that we will never see him again, at least on the face of this earth. Renato’s family had run both the shop and the hotel since 1908. Renato, or “Renatone” as he was nicknamed, had a kind word for everybody and I remember many memorable chats with him between his serving the customers. For him I was always the “professore”. I, like, all residents of (and visitors to) Bagni di Lucca will sorely miss him! I suppose, however, that the one disadvantage about living in a community where most people know each other and where I have now been a resident for ten years is that if one of us goes it is all the more noticed and felt. Goodbye Renato you were always kind and good to me – something that is becoming increasingly rare in today’s frenetic society. Renato’s funeral will be this Tuesday at Corsena church, Bagni di Lucca.. 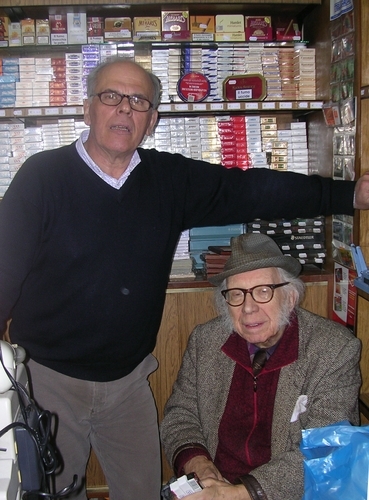 This photograph shows Renato in 2006 with one of his oldest customers, Sam Stych, who is still with us at the ageof 98. Then, Sam was able to walk down to Renato’s shop and Renato always had a chair ready for Sam to sit down on and spend time there before his homeward journey. Temperatures have suddenly plummeted here in Longoio. Yesterday there was a violent thunderstorm and it began to sleet heavily. Outside things looked drear and dismal. Today, however, we’ve woken up to a white dawn and more snow is forecast with temperatures reaching minus ten on New Year’s night. It might be a good day to take a walk as the sky is quite cloudless. But at the moment it’s still too icy and already a warning has gone out that hospitals already are having to deal with queues of people with fractures and broken legs. But it’s so tempting to go out in this splendid crisp, sunny and freezing winter’s day – the first one we’ve really had this season. Certainly, among our animals, our new arrival Cheeky is finding out about the white stuff for her first time. NOI (“us”) TV is our local TV station and it’s worth watching as not only does it give the local weather report and road conditions but tells us of what’s on around too. It was through my wife’s watching NOI TV that we didn’t miss one of the most spectacular presepi viventi (living cribs) in our area. It’s at Ruota which, although nestled in the Montagna Pisana (Pisan Hill), is still in Lucca province, being in Capannori Comune. I thought that all the presepi viventi in our area had stopped by Christmas day but the one at Ruota is always held on St Stephen’s day (better known in the UK as Boxing Day). This year it’s celebrating its twenty-fifth anniversary! The event started around 2.30 so we left shortly after lunch. 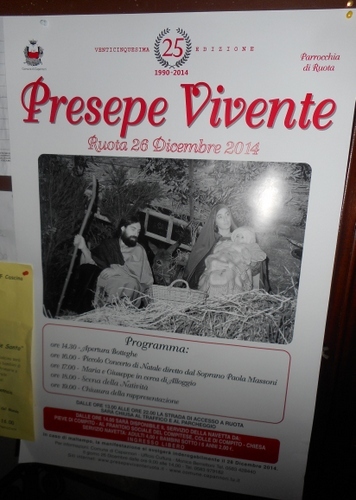 At Pieve di Compito we parked our car, paid a ticket of 4 euros each, which included the shuttle bus service (the road winding up to Ruota, which literally means “wheel”, is particularly narrow), admission to the presepe, a concert and tasters. Which means that the mountain’s there so that the Pisans don’t have to see the Luccans. (I would also add that the Luccans don’t have to look on the Pisans too!). I have done several walks in the Pisan Mountain and it’s great trekking country. The concert in Ruota’s beautiful church was delightful. Organised by a local music school it included everyone from children to mature musicians. Among the pieces played was a fair spate of Christmas carols with audience participation and also some Mariah Carey and jazz. The theme tune from “Cinema Paradiso” played on guitar and harmonica was particularly touching. Something about Ruota’s church: dating back to the eleventh century its exterior still retains Romanesque features. The single apse interior and apse, however, have been altered over the centuries. 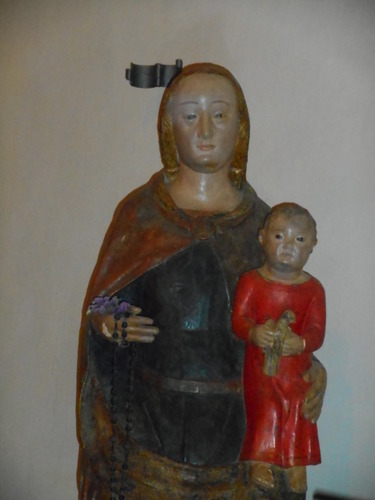 The wooden sculpture depicting the Madonna and Child from the mid fourteenth century was also quite wonderful. After the concert we joined the nativity procession as Joseph and Mary unsuccessfully called upon various traders to seek shelter. Finally they found a stable and the baby Jesus was born. The narrow streets and stone houses of Ruota proved absolutely right for a traditional presepe setting and for all of those present it provided a great Boxing Day treat. We are so privileged to be able to assist at these charming events which help to bring back the true significance of Christmas into our hearts. 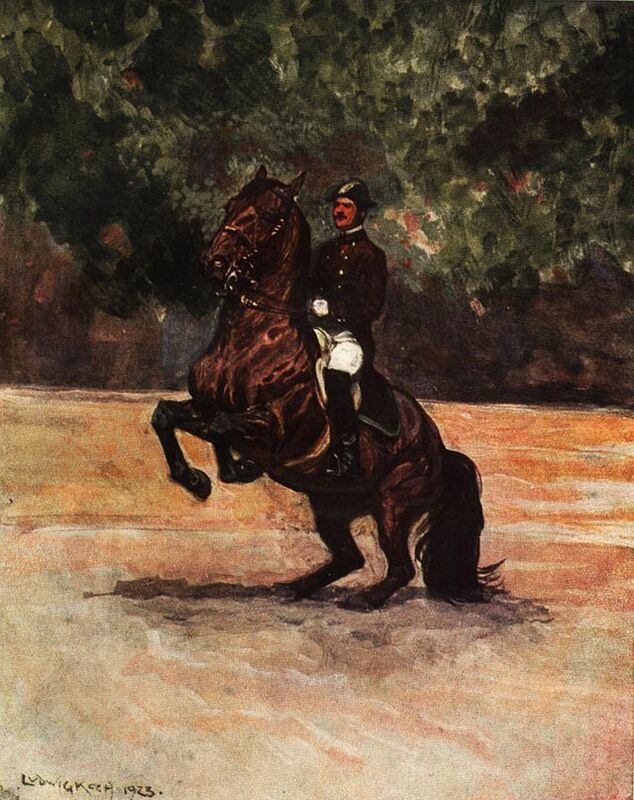 We’d first seen the equestrian ballet of the horses of the Hofreitschule (better known as the Spanish Riding School) some years ago in the vast spaces of the Wembley enclosed stadium in London. 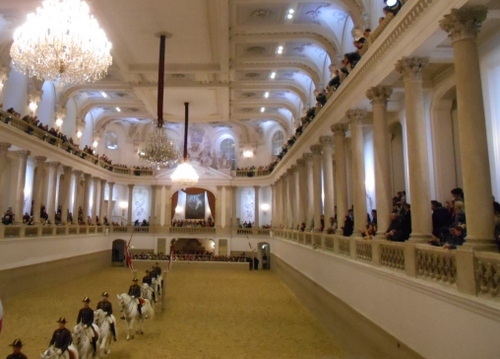 Although, I enjoy the occasional canter I’m not a passionate horseperson but, thinking that while in Vienna we should visit the horses and their trainers in the original location, I booked two tickets on-line from our hotel. The prices can shock all but the most devoted lovers of dressage as they rise to euros 300 for a show that lasts a little more than an hour. I managed, however, to find two standing room tickets for a little under euros 30. 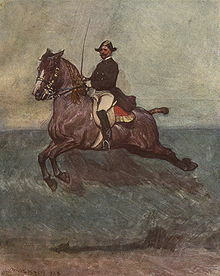 The Spanish riding school is not named after anything particularly Spanish about the training but after the fact that the original horses came from Spain. The present horses, as most of us know, are Lipizzaner and are bred at Heldendorf in lower Austria. 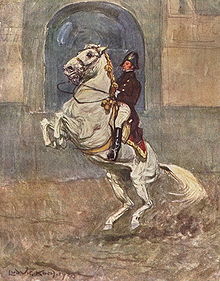 The original Lipizzaner came from Lipizza which is now in Slovenia. The show came fully up to our expectations. The elegance, colouring and precision of these magnificent beasts are awesome. This training was required when firepower was invented. The horses’ movements are not for attack but are to display their dexterity in getting out of difficult situations on the battlefield and under firepower. With the advent of guns and cannons, the cumbrous armour of knights and the cart-horse proportions of their steeds became quite useless. 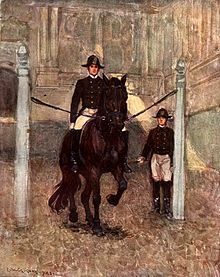 What was needed now was full flexibility and control of the horse and this is how the amazing routines of this riding school were developed. In 1729 the great architect Fischer von Erlach designed the present beautiful winter riding school which is where the displays take place. There was a ban on taking photos during the display. Clearly, flash photos would have distracted rider and horse but I noticed many people taking non-flash photos so I decided I’d include a few of my own. We were glad we managed to see this great Viennese tradition. Its original setting adds everything to the event. 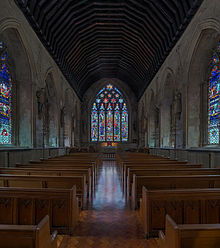 In London we loved going to the Midnight Mass at Saint Ethelreda’s, that beautiful gothic church in Ely Place, Holborn. The setting was magical and the sung Masses from Bach to Rossini were of a high standard. To enter into Christmas day here with equal harmony we attended the midnight Mass at il Convento dell’Angelo, a former Passionist convent set high among the hills of Ponte a Moriano near Lucca and certainly Nottolini’s masterpiece. Before the proper of the Mass the soloists training at Kuhn’s academy in the convent gave a short concert displaying their brilliant talents. The Mass followed interspersed with appropriate vocal items for the respective sections. 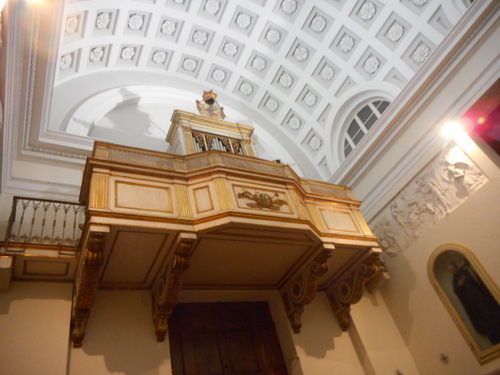 It was wonderful to hear the newly restored organ participate. Here is the programme for the evening. “The Christmas tree is you, standing firm against the trials of life. The guiding Star is the hope within you to strive to higher things. With all my confidence that this special night becomes even more special. Because you are special, your are the best presents”. “I can’t add anything to what the Pope said”, commented the priest and the Mass continued to its joyous conclusion with “Silent Night” sung by the vocal soloists in German, English, Irish, Chinese and Japanese according to their first languages. The world appeared united here and we were moved. I, too, can’t add anything to what I’ve already written except to wish all my blog readers a Very Joyous Christmas and a Happy and Prosperous New Year.